The spacer creates space to store the water, while above it virtually any type of green roof and roof utilisation is possible. The throttle element has a throttle opening and an overflow that extends upwards. It is inserted into the gully within the inspection chamber. 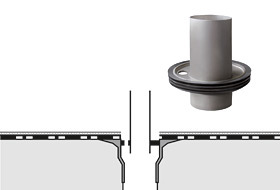 The ZinCo spacers allow for water storage on the roof and time delayed run off. This provides considerable relief for the sewerage system. 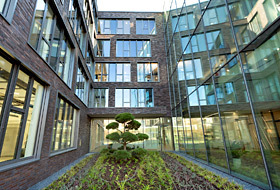 Extensive green roof with stormwater retention across the actual roof area of 3,800 m² resembles sealed surfaces such as is the case in the entrance area of the new company building. Source: Mitsubishi Electric Europe B.V.
Grasses and groundcover in the atria create a frame for the eye-catching topiary. 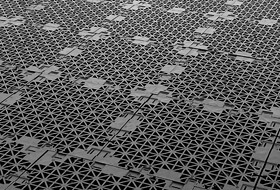 ZinCo spacer elements are also used here. The increase in rain events and flooding and a lowering of the water table are clear indicators that the ecology of the water cycle has been severely impaired as a result of climate change and the consistently high level of soil sealing. This is where green roofs come into play, providing additional green space in densely developed urban areas. Each green roof stores a certain quantity of stormwater and then allows it to run-off in a time delay or to evaporate on the roof. The new Stormwater Management Roof from ZinCo expands this retention effect and in so doing effectively balances out precipitation peaks. A very promising solution! According to statistics from the German Federal Ministry for the Environment, 69 hectares of land were rezoned for settlement and infrastructure development in 2015. This is the equivalent of just under 100 football pitches per day. The effect of this sustained level of soil sealing is that stormwater can no longer seep into the ground and public sewerage systems become quickly overwhelmed during severe rain events, resulting in flooding. It is becoming ever more important to implement measures to unseal the soil, for example, city planning authorities are stipulating green roofing in their development plans and are acknowledging by means of reduced waste water charges the capacity of green roofs for retaining water. This capacity is referred to as stormwater retention and has considerable potential. The aim of stormwater retention is to suppress precipitation peaks and extend them temporally. According to the guidelines of the German Meteorological Service, heavy rain in Germany is defined as being more than 5 l/m² of rainfall in 5 minutes, more than 10 l/m² in 20 minutes or more than 17 l/m² in one hour. However, heavy rain can be a lot more intense than this. On 28 July 2014, 292 l/m² of rain fell in Münster in a period of seven hours. Each individual green roof, therefore, contributes to the alleviation of the public sewerage system. For example, a standard extensive green roof stores between 20 and 40 l/m² of water in its green roof build up and an intensive green roof stores between 50 and 100 l/m², in some cases even more. With regard to the risk of flooding, a green roof should store as much water as possible. Otherwise, the excess water available to plants can result in a transformation of the vegetation and therefore to a requirement for increased maintenance and care or even to water logging and root rot. For this reason, ZinCo has developed the new Stormwater Management Roof in two separate parts, the retention volume and the actual green roof build-up. In the new stormwater management roof an element referred to as a “spacer” is used beneath the green roof build-up. The height of the spacer can be varied, as required. 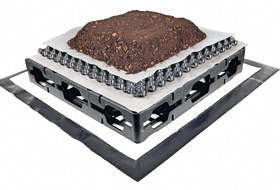 For example, a 10 cm high spacer allows for the storage of about 80 l/m² of rain, based on a zero pitch flat roof with the required load-bearing capacity. 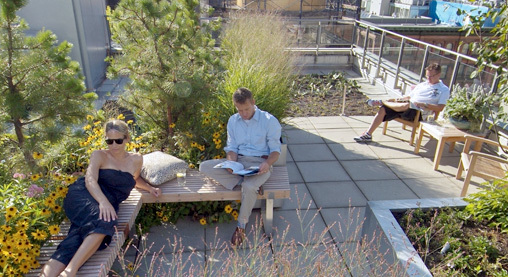 The retention capacity of the green roof can therefore be increased by a multiple. During a pre-defined period of time (between 24 hours and a number of days), the retained stormwater runs off slowly through a throttle element inserted into the gully and on into the sewerage system. In order to ensure that these parts continue to work perfectly, the gully and the throttle element are located for their protection inside the inspection chamber, where the fine slits prevent foreign particles from being washed in. The green roof build-up over the spacer contains all elements that are required for the green roof to function properly, for example, air-water household in the root area, drainage and water storage for the plants. An intensive green roof, naturally, requires a greater level of water than an extensive roof that has drought-resistant sedum plants. Each green roof build-up, is therefore, adapted to suit the relevant vegetation. Virtually all types of green roof and roof utilisation are possible, even pathways and driveways. Developing the stormwater management roof in two parts allows for a lot of water to be stored regardless of the level of water required by the green roof itself and without any risk of vegetation transformation or water logging. The building-specific values for the stormwater management roof are ascertained based on the local climate, on precipitation levels and the required level of retained stormwater. This includes the maximum storage volume, the maximum drainage quantity per time unit and the period of time required until the water storage area is once again available. The drainage calculation is carried out by the company Sita Bauelemente GmbH, a professional ZinCo partner, which also provides all necessary drainage elements including the throttle element. 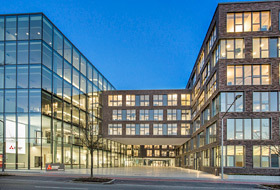 In 2015, the new German headquarters of the Japanese company, Mitsubishi Electric Europe B.V. was built in Ratingen and incorporated a stormwater management roof into the building. This stipulation set down by the City of Ratingen fitted well with the corporate guiding principle of “Changes for the Better” and the environmental declaration “Eco Changes” of this world leader in the electrical engineering sector. The company aims to reduce the environmental impact of its business activities and to contribute to the protection of the species. This is to be achieved so that LEED certification in the highest category, Platinum, will be awarded for the new office and administration building in Ratingen. The Leadership in Energy and Environmental Design (LEED) defines a series of standards for environmental, resource-conserving and sustainable building. Green roofs and particularly stormwater retention roofs make a valuable contribution to this. The building complex comprises an area of about 16,000 m² of office space over five floors for up to 750 employees and has 500 underground parking spaces. The architectural concept of the commissioned architects kresings architektur GmbH from Münster basically divided the building into two separate parts that present towards the North and the South as separated, solid brickwork façades. Two light-infused atria in different sizes were created as a result. The two atria with a combined area of about 640 m² were developed as intensive green roofs and contain grasses, groundcover and topiaries as solitary plants and also some circular pathways. The actual roof area of about 3,800 m² was installed by the experienced ZinCo roof gardeners, Ahrens & Krämer GmbH Garten- und Landschaftsbau from Erkelenz. Various different types of sedum are planted here as germinating seeds. 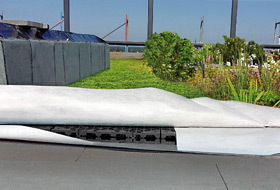 6 cm high ZinCo spacer elements were installed across the entire roof area beneath each of the two types of green roof. Up to 40 l/m² of water can be stored within these elements (after subtracting material thickness and air volume), that is to say a maximum of about 4,440 m² x 40 l/m² = 177,600 l = 178 m³ water, which runs off in a time delay, providing effective relief for the sewerage system. Added to this is the stormwater capacity of the extensive and intensive green roofs. They help to balance out precipitation peaks and reduce the risk of flooding. ZinCo has created a true innovation with its stormwater management roof on the new Mitsubishi Electric Group headquarters building in Ratingen. In times of progressive soil sealing, overheating of urban areas, heavy rain events and floods, a green roof is becoming an ecological necessity. 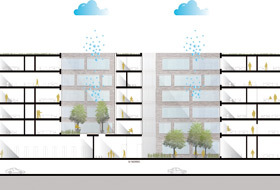 It improves the climate, absorbs dust and pollutants, balances extreme temperatures and stores water, and does this together with the new stormwater management roof in a unique manner for protection against floods.